Full Disclosure: You could call this a review, but I'd classify it as a presentation of the info gained from an interview with the vehicle itself. This is my experience with a disturbingly delightful truck. Enjoy. Some background on this vehicle. It has a lot of interesting traits/features. Each one of these traits/features aid in making this vehicle large, loud, tall, leaky, rough, frightening, hilarious, and awesome. Yes, that is a spring from a Volvo 850 keeping the truck in place. So the truck. The owner bought it from a guy selling it as a parts truck and as such is a work in progress. It's a 1992 Ford F-250 XLT. This was before the "Super Duty" title, but it's definitely a very heavy duty piece of machinery. For example, sometime down the road during its life, the truck received a new front bumper: a cast iron beam that's extremely strong and unbumper-like compared to bumpers of the past 40 years. It could probably split a tree in half, shatter some bones, chisel away a mountain—you get where I'm going. It makes the truck feel blunt and menacing standing next to. It also makes a great place to stand while observing the massive diesel V8. To view it, one must pull the jury rigged cable protruding from the grill to pop it loose. Once open and running, the clacking and burbling of the Navistar International sourced engine is deafening. Fun fact about the engine: It's the most powerful naturally aspirated diesel in a production truck. It's a 7.3 liter naturally aspirated V8 with indirect injection. The system injects fuel in a preignition chamber designed to properly mix the air and fuel before it goes into the combustion chamber. This sort of system seems to have disapeared these days so I'm not sure it has a definitive advantage over direct injection diesels. The current owner has done some work to keep the IDI running in tip top shape. A coolant filter is the most notable. The coolant filter is set up in a very convenient system of ball valves that allows swapping of the filter in minutes. And it works too, the gunk and other crap it picked up in the early days of its install was unreal. The picture below is what was dumped from the filter. Keep in mind the coolant is supposed to be red. The rest of the drivetrain consists of a ZF 5 speed manual transmission, a transfer case and 2 sort of solid axles. To drive this thing, I had to learn to float gears. Floating gears is a method of shifting used mainly by truckers to shift a bit easier with unsynchronized gears. The clutch isn't used, which is the main reason the owner of this truck shifts that way. It has synchronized gears, and the clutch on the truck is fine, but there's a very fragile part in the system connecting the pedal to the actual clutch assembly, so floating the gears should extend the life of that fragile part. Floating gears is probably a new thing for some of you, so here's an example: If I'm shifting from first to second, I pull the shifter out of first and into neutral and then put some pressure towards second. At the same time I let the RPMs slowly fall, and when the RPMs between the engine and transmission synch up, the shifter slots into second neatly. It takes some thinking to get used to but isn't too complicated once you've done it a few times. The transmission sends power to the rear axle, and also the front axle if the driver decides the extra traction is needed. But in this particular truck, acting on this decision is a bit more complicated than expected. Most trucks have a selector in the cabin that switches the transfer case into 4WD. The selector in this truck is gone. It has been tastefully replaced with an empty Mountain Dew can. Of course, the can doesn't allow the driver to switch drive modes, but it does fill the hole in the cabin that goes through the floor pretty well. Switching into 4WD requires manual movement of a little lever in the transfer case. Which isn't to difficult really if the truck is off and stationary. When it's running however, since the truck has no parking brake, it is essential to have a buddy hold the breaks for you, chalk the tires, or be parked on a surface that the truck is stationary over. How convenient! All of the driving I did in this beast was in RWD, as making corners in 4WD is very clunky. Plus, turning in RWD is hard enough. The insane effort required to turn the wheel comes from a few different things. For starters, the power steering pump has failed. Then there's the massive tires that have a very large contact patch. Needless to say, navigating any sort of twisting asphalt is quite the workout. But even driving straight ahead is just as difficult. The steering speed is very slow, and seems to have a solid 50+ degrees of rotational deadzone. Constant attention is required to make it somewhere safe. See? Super Involving. The ride is very trucklike. Clunky and bouncy. 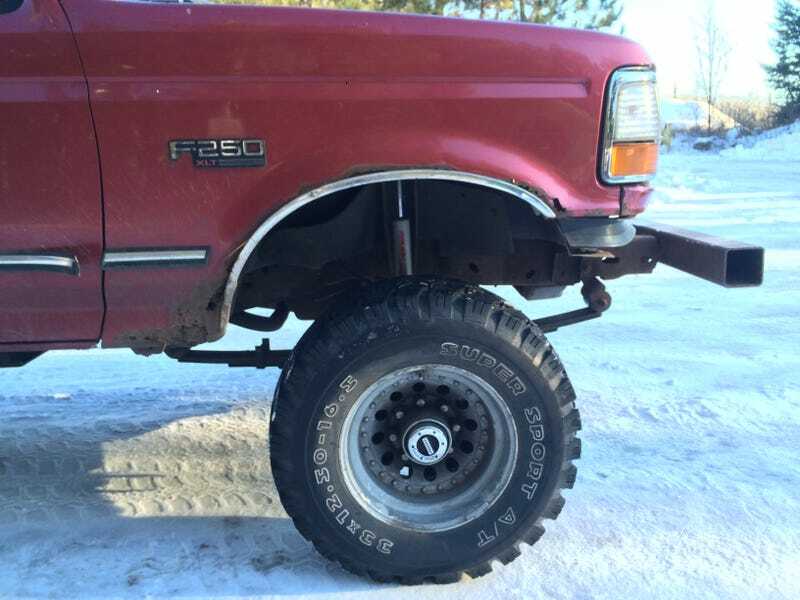 Yet this is despite Ford's effort in making a whole weird sort of split solid front axle. As you can see, it looks like they just hinged a solid axle. It may be better than a normal solid axle, but it's tough to imagine. Despite all of the sketchy maneuvering, the truck was still a blast to drive. I'm used to driving a sedan and going from that into a massive truck felt like driving a skyscraper. And the sound this thing makes is unbelievable. I have no doubt it could be heard from miles away. It's like a thundering rumble of eight 12 inch naval cannons. It make one giggle in awe and terror when it's revved. Piloting this vehicle was the most involving vehicular experience of my life so far. I've driven dozens of cars, flown a few airplanes, but no vehicle has ever demanded my involvement more than this Ford F-250. What a wonderful beast. Special thanks to SwedishMetal for providing the truck and a few photos.